If you’ve had an eye exam, there was a part of the exam where the doctor asked you, “Which is better, one or two?” The doctor was using a device called a phoropter to measure your refractive error. He then gave you glasses or contact lenses to correct your refractive error so you could see 20/20. Usually, he didn’t try to correct to better than 20/20. In fact, in decades past, most eye charts stopped at 20/20, so the doctor couldn’t measure whether your vision was better than 20/20 even if he wanted to. Many doctors still feed these same phoropter measurements into their excimer lasers for LASIK, with the same result. When I started doing LASIK procedures, in 1991, my colleagues and I thought that achieving 20/20 vision was a great result. After all, 20/20 is considered normal vision, and our patients who had been coping with poor vision for decades were delighted to have 20/20 vision. But while most people see 20/20, some people naturally see better than that. People with 20/15 or better vision can see the spin on a tennis ball, or can see a golf ball on a green 200 yards away. The famous test pilot Chuck Yeager, the first pilot to ever fly faster than the speed of sound, reportedly had 20/10 vision, which is twice as good as 20/20. This was part of the reason he was a fighter ace in World War II—because he could see enemy planes long before they could see him. Figure 17. Wavefront technology allows an ophthalmologist to measure your eye’s imperfections at 1,200 points on the eye, compared to only a single, central point measured by older technology, used for eyeglasses. 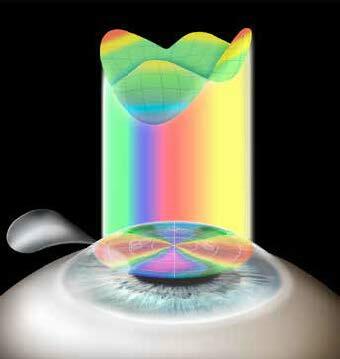 With the use of wavefront, you can achieve better than 20/20 vision. At the end of the 1990s, David Williams at the University of Rochester asked why so few people saw better than 20/20. Studies found that everyone has imperfections in the way the eye focuses light, even after the myopia, hyperopia, or astigmatism are corrected by glasses or contacts. These imperfections are called higher-order aberrations. They prevent the average person from seeing better than 20/20. As mentioned eariler, a new technology called wavefront-guided LASIK now lets us achieve super vision in the majority of our patients.